Hi, my name is Tupelo Kenyon, and I am a full-time learner and part-time teacher of personal development. Since the early 70’s most of my “teaching” has been through my original songs with themes of personal growth and discovery. Although a four-minute song has the potential to “go deep” and deliver a valuable nugget of truth, I appreciate this blog format that allows me to archive unlimited articles that allow for even more depth. My passion has always been in creating soothing instrumental music and songs with the potential to inspire — music that matters for people who care. That same passion is now inspiring these original articles with ideas that have the potential to make a positive difference in people’s lives. My personal mission is to continue learning while attracting others of like mind, and to offer helpful ideas for their own unique process of personal growth. My motivation in creating TupeloKenyon.com is to provide a valuable service — a meaningful contribution, which results in a gratifying life of independence and joy for others as well as myself. The purpose of this website is to make it easy for every visitor to have these ideas, techniques and tools at their fingertips, for the good of the whole. 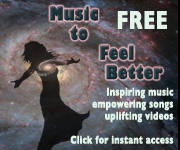 This website is dedicated to personal development inspiration and uplifting music. Here you can discover in-depth articles on awareness, manifestation, productivity, relationships and related topics of personal growth. Besides the in-depth articles, what makes TupeloKenyon.com unique among all the personal development blogs is the music. Each article includes links to relaxing instrumental music for listening while reading. Along with my wife, Janey, I have recorded eleven CDs of original music through the years and choose to give it away as streaming audio to my readers. I can do this because I still own the rights – never having signed away my copyrights to publishers or record companies. That’s what makes my site different – this idea of in-depth personal growth articles accompanied by music specifically chosen to enhance the ideas and tone of each article. Since the site is supported by ads relevant to the subject matter of each article, I am able to make all the content free. Free articles . . . free instrumental music while reading . . . and free songs to add a new dimension to the subjects discussed in the articles. It is my intent to help you jump-start your creativity and help you feel good. That’s the bottom line — it’s all about feeling good. All aspects of life are brighter when you feel good. I hope this helps. Celebrate life by taking control of your expanding consciousness and personal growth . . . your way!